In late April, I had the opportunity to sit down with Chef Tim Grandinetti and learn more about his new Italian restaurant, Quanto Basta Italian Eatery & Wine Bar. It opened on March 5, 2015, and is a very different vibe from Chef Tim’s first restaurant Spring House Kitchen, Restaurant & Bar. To find out more, you’ll want to keep on reading. Caution: Reading this article is likely to make you very hungry for delicious Italian food. I grew up in Hudson, NY, in an Italian family. There were festivals all the time, all us kids played together every day and pasta sauce was always cooking on the stove. My great-grandfather came to New York from Calabria, Italy via Ellis Island in 1911. 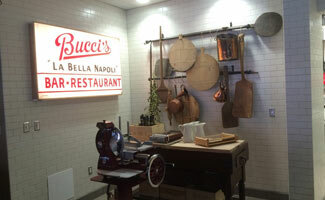 He had his own Italian restaurant and market called Bucci in Hudson and you can now see the sign here on the wall at Quanto Basta. He inspired me. So did my mom. In an Italian family, cooking and good food is a way of life. There was fresh bread every day and we always ate what was in season… not because it was trendy but because it’s what we had and what was affordable. So, I grew up in the kitchen. But, don’t take this the wrong way, but cooking Italian food was easy to me. So, I started out interested in cooking professionally but more in the Classic French-style vs. Italian. Italian was home but French was what people wanted at a restaurant, at the time. My love, my passion – it lies in the kitchen. What Is Your Training As A Chef? I trained in many different places but it all started with Classic French. While I worked at many places before, the Marriott really helped me hone my passion into a true skill of not just cooking but also running a business. It is important for chef’s to remember that there are two arts to running a business: (1) cooking food people love and (2) running a profitable, successful business. Marriott taught me that and I am so thankful. I was with Marriott for 12 years in several different cities including Washington DC, St. Louis, Raleigh and eventually they brought me here to Winston-Salem. 6 years later, this is home and we (Tim, his wife and their children) love it. What Brought You To Winston-Salem? Marriott brought us here and we saw so many great things going on. The first restaurant I ate at was 6th and Vine and I remember it so vividly. Sitting at the bar eating a delicious meal and watching sports on the TV… it was so welcoming and comfortable. A few days later, I stumbled into Foothills and now I am proudly the #83 mug at Foothills, which just celebrated their 10th anniversary so I felt like I was part of something big from the start. There were a lot of good things coming to life in Winston-Salem and I wanted to be a part of it. 3 years ago I worked with Lynn and Lynette Murphy and my wife to open The Spring House and we were so well received. The Winston-Salem community really opens its arm’s wide for new restaurants and we felt so humbled by this welcome. It is a busy and growing restaurant scene so we know our guests have choices. The fact that we were among them, and even the favorite of a few, was great. What Inspired You To Open An Italian Restaurant? You may not believe this but it all started with a cocktail napkin. So cliché but it’s the truth. I was talking with my business partner, Lynn Murphy, and things were going well with Spring House and it just kind of all came together. Lynn was working in this location that was originally the Piedmont Gas & Electric offices and it was closing down as an office space. So, as we talked about my dream of having a more casual, throwback Italian restaurant, he thought, well, I might just have the perfect spot. Italian food is very comforting. What Does Quanto Basta Mean? It literally means “as much as you need” or “as much as you require” but it came from me cooking from Italian recipes and it always saying QB beside seasonings instead of a measurement (e.g. tablespoon, teaspoon, etc.) so I finally look it up! QB was the Italian version of American cookbooks saying “add salt to taste” or “add a pinch of pepper”. But, it seemed like the perfect restaurant name because I wanted to people to literally feel they could order and enjoy exactly as much as they want – whether that’s a pizza to go with a beer at the bar while they wait or a 4 course celebratory meal accompanied by the perfect wine pairing. The color palate is what you would find throughout my hometown of Hudson, NY, especially the exterior. A Tuscan wine tower is the centerpiece for the whole design and is the first thing you will notice when you walk in the front door (behind the hostess stand). I really wanted for the bar to have rounded corners because I have noticed over the years that the corners of bars tend to be great for conversations between people who may start in different parties or on their own but end up making new friends. Speaking of building community, I also wanted a communal table as a central part of the design. The banquets are straight out of 1905’s/60’s era New York, which is where much of my inspiration for the menu and décor are founded. Anything Unique We Should Know About? We have a very carefully curated wine list (200 wines total: 50 Italian and 150 from every major wine region around the world). 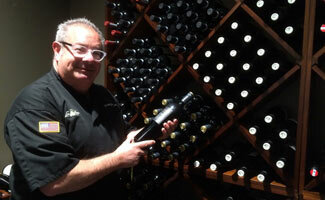 The wine selection is constantly evolving to bring new things you won’t find at other restaurant in Winston-Salem. We also offer flights so you can try a few different wines before you commit to a full pour. There is something for everyone – from the connoisseurs to the beginners and everyone in between. 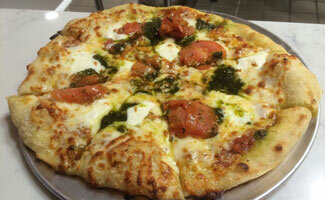 I would say we are your quintessential, retro Italian-American menu with contemporary, fresh plating. But, you won’t find any lasagna here because no one can make it better than your mom! What is the one reason people should try QB and come back again? Our staff is gracious, genuine and passionate and they are serving up delicious, honest food. Surround yourself with bright, shining stars in the kitchen to raise everyone’s game. Monday – Thursday: 4 pm – midnight. Friday and Saturday: 4 pm – 2am. Starting early summer, family style dinner will be served on Sundays. For updated information, visit their Facebook page. Note: Quanto Basta does not accept reservations so expect to wait, especially with a large party. But, we hope you will agree that it is worth the wait! 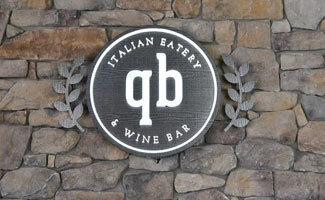 Have you eaten at Quanto Basta? Did you love it?